Photo: PATH/Trevor Snapp. 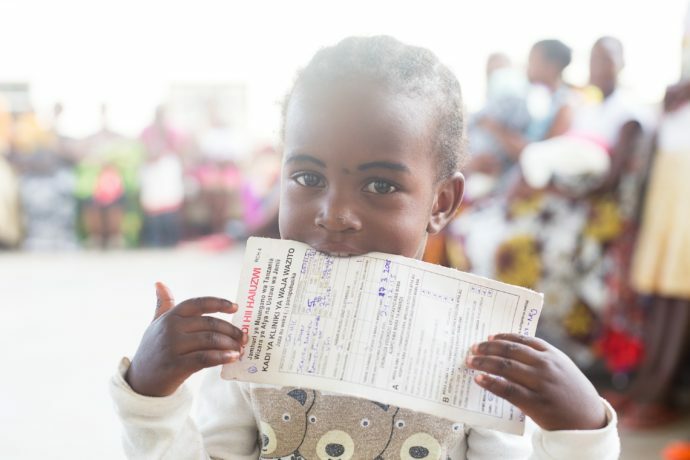 A young patient holds a child health card. The following post appeared on path.org. Global funders, country policymakers, and immunization program implementers know that the use of high-quality data is a cornerstone of well-functioning immunization programs. When high-quality data is available, public health decision-makers can understand which populations are underserved and where resources can be allocated most effectively. Immunization coverage rates have improved over the past few decades, but they have plateaued around 80 percent. The challenge with reaching the last 20 percent of children is to know who they are and where they are, which requires easily accessible and accurate data along with the capacity to interpret that data to take action. What has been missing is clear, evidence-based guidance on where, when, and how to implement and fund interventions to improve data quality and use. How can health workers be best supported to collect better data? How can technologists be supported to build information systems that supply decision-makers with useable data? What policies are needed to ensure health facilities have the human and technology resources needed to make better use of data? Where should funders focus to ensure their investments are having the most impact? The Immunization Data: Evidence for Action (IDEA) project, led by PATH and the Pan American Health Organization (PAHO), was designed to answer these questions and identify best practices that can be adopted by funders, policymakers, and implementers to improve the quality and use of immunization data. The project has reviewed and synthesized evidence on what works to improve immunization data use and why it works. The IDEA review, A Realist Review of What Works to Improve Data Use for Immunization: Evidence from Low- and Middle-Income Countries, identifies five top findings and outlines how funders, policymakers, and program implementers can act on these findings to improve immunization outcomes around the world. Interconnected strategies get better results. Immunization data use improves when programs use a set of mutually reinforcing strategies including capacity-building and behavior change management. Data use leads to better data. When data starts to be used, health care workers and managers can see its value to their daily work and begin to place more emphasis on improving its quality. Systemizing data use leads to long-term success. Interventions are more likely to be successful long term if they institutionalize data use through practices such as dedicated staff positions for data management and routine data review meetings. Health management information systems (HMIS) and logistics management information systems (LMIS) increase availability of higher-quality data. These digital systems have made higher-quality data more available to decision-makers in real time. Digital systems show promise, but barriers still exist. The transition from paper to digital systems has made higher-quality data more available but has not automatically translated into greater data use. PATH and PAHO will use these findings to further their efforts toward improving immunization equity, while also encouraging others to adopt them. IDEA is now actively disseminating these findings to help ensure they are considered as immunization programs are designed, funded, or implemented. IDEA partners launched the #FindYourFinding interactive campaign, inviting practitioners across the immunization and global health community to explore the IDEA review, identify what evidence is most relevant to their work, and share how they plan to act on those findings. The IDEA project was funded by the Bill & Melinda Gates Foundation. The IDEA steering committee includes global and regional senior leaders in the areas of immunization, data quality, and use from World Health Organization; US Centers for Disease Control and Prevention; United Nations Children’s Fund; Gavi, the Vaccine Alliance; and the Swiss Tropical and Public Health Institute. The committee also includes country representatives from both the BID Learning Network and the Improving Data Quality for Immunizations project.